The Iller Creek hike offers spectacular views of the Valley and the Palouse. Best for: Moderate hiking/walking and trail running. Mileage: Five-mile loop from Iller Creek trailhead. 2.5-mile up-and-down from Stevens Creek trailhead. Both trails merge at the top, called Rocks of Sharon, with access to Tower Mountain. Why go: A great hike, relatively short, with tons of reward at the top. You can sweat a lot or a little depending on which trailhead you use, and how fast you go up. How to get there: Iller Creek Trailhead: 9000 E. Holman Rd. Coming from Sprague Ave. or Appleway Blvd., turn south on Dishman-Mica Rd. Turn right on Schafer Rd. at a stoplight. Continue until a stop sign at 44th Ave. Turn right. Take first left onto Woodruff Rd. Turn right onto Holman Rd., follow uphill until the dead end and parking area with gate and outhouse. Stevens Creek Trailhead: 8901 S. Stevens Creek Rd. Coming from South Hill / Valleyford on Palouse Highway, turn left or right (depending on direction) onto Stevens Creek Rd. Drive 2 miles to trailhead, on left. Don't miss: 360-degree views atop Rocks of Sharon are best from on the rocks, if you feel comfortable with a scramble up. Be careful! Look south toward the Palouse and see Steptoe Butte in the distance. FYI: The area is popular with mountain bikers, too. On corners, be careful, listen for bike traffic from ahead or behind, and always make your presence known. Make noise! Tip: On Iller Creek loop, the east side begins with more switchbacks but is steeper once you get up halfway. The west ascent is more gentle and forested/shady along a riparian stream. Take that into account, given the heat and what you prefer regarding uphill vs. downhill. Best for: Easy walking and hiking. Mileage: 464 acres with multiple intersecting trails and loops. Why go: Close to the city with good views of downtown. Close enough not to drive too far, but far enough to be near nature, near perfect. History: The area is maintained by the Palisades Park Organization, a nonprofit friends group in the neighborhood. More info and a good park map are at palisadesnw.com. Best for: Easy to moderate walkers, hikers, trail runners. Mileage: Varies depending on loops you take. From two to eight miles depending on routes. See maps at trailheads or tinyurl.com/DishmanHillsCampCaro. Why go: Close to the city but nestled south of I-90 against neighborhoods. The interior areas are wooded and shaded enough to not see the city around you, making you nearly forget you're that close. Rock outcroppings halfway up (Nimbus Knob) and the "top," Eagle Peak, offer panoramic views of Spokane, the Valley and into the Idaho panhandle. How to get there: 625 S. Sargent Rd., Spokane Valley. From Sprague Ave. or Appleway Blvd., park in upper or lower parking lots at Camp Caro off Appleway Blvd. FYI: Camp Caro is a community park managed by Spokane County. It features a playground and large grassy area for picnics/volleyball/etc. and a rentable lodge for day functions. Bathrooms at Camp Caro are available from late May through mid-September. Tip: Most people will park at the Camp Caro trailhead, but two other access points off 8th Ave. and Siesta Dr. are available, and are less crowded. History: The area is co-managed by Spokane County, the Washington State Department of Natural Resources and the nonprofit Dishman Hills Conservancy. Best for: Moderate to intense walkers, hikers and trail runners. Why go: Early season will bring a good flow in the waterfall about halfway up the loop. The view north and east toward the lake is very nice from the trail on the switchback section above the cedar grove. How to get there: Liberty Lake Regional Park (Spokane County). 3707 Zephyr Rd., Liberty Lake. Use Liberty Lake exit 296. Go straight on E. Appleway Ave. Turn right on N. Molter Rd. and continue until you reach E. Valleyway Ave. (The golf courses will be on the left.) Left on Valleyway Ave., which turns into S. Lakeside Rd. Remain left at the "Y" and follow road signs to the park entrance on Zephyr Rd. FYI: In summer, (Memorial Day to Labor Day) the county park charges an entrance fee of $2 per person over age 6 for entrance between 9 am and 5 pm. The park includes a swim area, picnic shelter and bathrooms, along with limited camping. The trail is also popular for mountain biking and horse riding, so be aware. Tip: Doing the loop clockwise will be flatter in the first two miles until you reach the cedar grove, but you'll quickly gain the rest of the 1,200-foot elevation in the next 2 miles. The counterclockwise direction includes a large, steep grade (called Edith Hill) 1 mile in, but flattens out afterward for a more gradual ascent to the top. Best for: Moderate to intense hiking. Mileage: Variable depending on starting point within park. Mt. Kit Carson, west of the Mt. Spokane summit, is accessed by several trails, number 130 or 160. Consult a park map in advance to determine your preferred route and mileage. The shortest option and quickest access is from the Cook's Cabin trailhead off the Summit Road inside the park. Why go: Indeed, there are numerous hiking trails — 100 miles worth — in Mt. Spokane State Park. The Mt. Kit Carson Trail, off of taller Mt. Spokane, is equally worth it for its views and will most likely be less crowded. How to get there: Main Park Entrance: N. 26107 Mount Spokane Park Dr., Mead. See park map for multiple access points to Mt. Kit Carson trails. FYI: Discover Pass ($30 annual / $10 per day) required for parking in all Washington state parks. Or take advantage of free state park entry days: Aug. 25, Sept. 26, Nov. 11. A small campground is available at Palouse Falls. Best for: Easy to moderate walking/hiking. Some scrambling required (careful!) if you're adventurous and want to get close to the very edge of the falls at the top or bottom. Mileage: Variable; 1 to 3 miles depending on where you go. Why go: Eastern Washington is full of geologic history and treasures, if you know where to look. It's not all farmland to the west and south of Spokane. 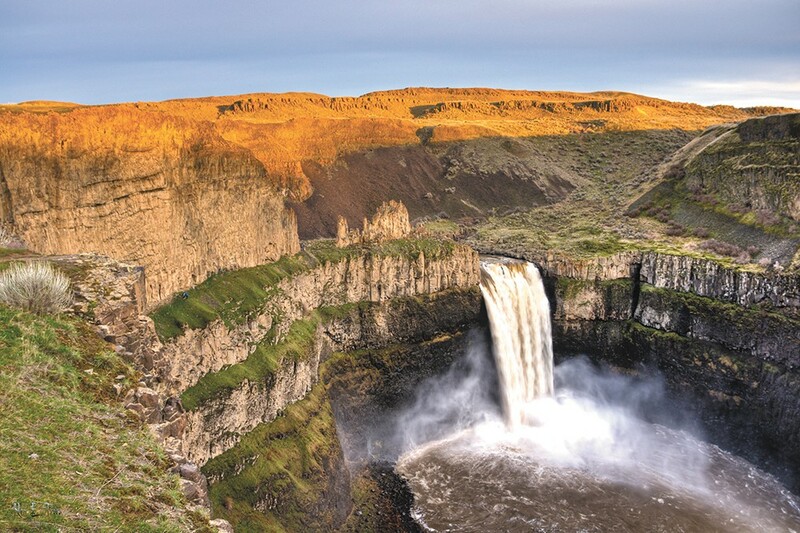 Palouse Falls is a real natural treasure, relatively close by. How to get there: Located in: Starbuck, Wash. (there's not much else around). From Spokane, take I-90 east to Ritzville and exit 221. Follow Hwy. 261 south, going across Hwy. 26 and the town of Washtucna. Continue south on 261, eventually turning right to remain on 261 and follow signs to the park. Mileage: Numerous trails begin and merge around the Bowl and Pitcher. Easy strolls of a mile or less, or an all-day adventure further into the park, are possible. Why go: At 14,000 acres, Riverside is the largest state park in Washington. The short trails just around the Bowl and Pitcher on the river are worth seeing for river and basalt formation views. How to get there: 4427 N Aubrey L. White Pkwy., Spokane. From downtown, head north on Maple St. to Maxwell Ave. Turn left (west) and then continue on Pettet Drive (down "Doomsday Hill"). Continue straight on Downriver Dr./Riverside State Park Dr. Entrance is on the left. Don't miss: In late spring and summer, kayakers and rafters on the Spokane River can be seen from the swinging bridge. Bring a camera! Pack a picnic for eating in the shelter along the river or in the campground picnic area. Best for: Moderate to advanced hiking or trail running. Mileage: Seven-mile loop with significant elevation gain. Why go: Start off flat with views of historic Native American painting (called Indian Painted Rocks) for a short, easy hike. If you want to keep ascending the full loop for the harder hike (and worthwhile view), go for it. How to get there: 5800 W. Rutter Pkwy., Spokane. From downtown, head north on Maple Street to Francis Avenue. Turn left (west) and then right on Indian Trail Road. Continue onto Rutter Parkway. Best for: Moderate walking and hiking with views higher up of Spokane River and North Spokane. Mileage: About a 5-mile round trip, with options to extend on numerous side and branch trails. Why go: You'll get a good diversity of landscapes and vegetation in a short distance, including a creek bed, ascending through basalt outcroppings, and up to a higher overlook with good opportunities for large bird sightings. How to get there: Approximate address for trailhead: 10502 N. State Park Dr., Nine Mile Falls. From Highway 291/Nine Mile Road, turn onto Seven Mile Road, crossing the Spokane River and heading west. Continue past the first intersection with the Centennial Trail for about a mile. Turn right on N. Riverside State Park Dr. and follow signs to Deep Creek parking area. Don't miss: In summer, the creek bed should be dry, and is a worthwhile hike up and down, off the formal trail. Explore it and all the cool rock formations in both directions. Summer in Coeur d'Alene is not complete without a visit to Tubbs Hill. Best for: Moderate walking and hiking. Mileage: 5.5-mile loop with elevation gain to 3,370-foot summit. Why go: Close-by hiking in the Spokane Valley area, not as busy as Dishman Hills, and on the opposite side of the valley, allowing closer vistas of Mt. Spokane and Liberty Lake. How to get there: Look for the Lincoln Road Trailhead on eastside of Antoine Peak. From I-90, take Barker exit 293, driving north on Barker Rd. to Trent. Turn right, heading east on Trent. Turn left on Campbell Road, driving north about 1.5 miles. Left on Lincoln Road. Parking area is about half a mile ahead. FYI: Don't forget about winter recreation possibilities, including snowshoeing and cross-country skiing. Best for: Easy to moderate walking and hiking. Good wildlife viewing opportunities due to low vegetation and few trees. Mileage: Multiple trails intersecting, about 7 miles total. Why go: It's among the newer areas acquired by Spokane County in the Conservation Futures program, though not as big or steep as others. Its quick access in the Valley and off of I-90 makes getting to it from any point in the area relatively easy. How to get there: From I-90 take Barker exit 293. Drive south on Barker Rd. to Sprague Ave. Take a left on Sprague, driving east to Henry Rd. Turn right on Henry, driving south. Trailhead is on the left. Don't miss: Keep quiet and you might see more wildlife than on other trails, particularly white-tailed deer or the occasional coyote. Watch out above for big birds of the hawk variety. Tip: It's also a good snowshoe spot in the winter. Mileage: Varies depending on route, from 2 to 5 miles in the immediate area. 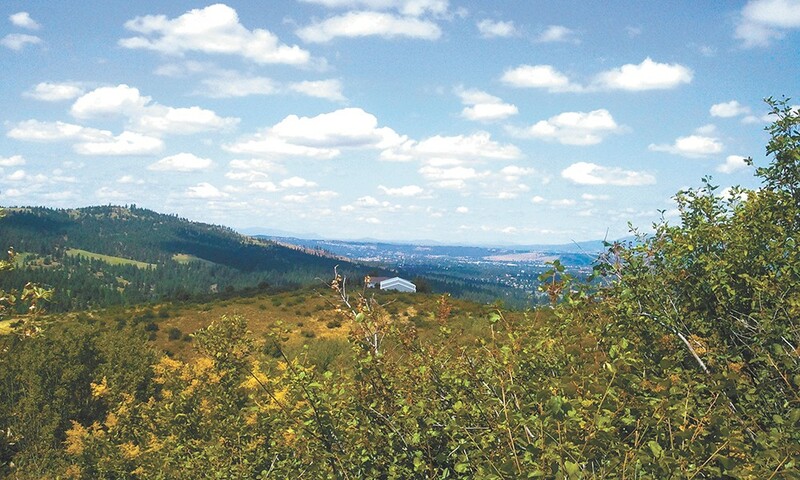 Why go: This may be the most central hiking area for the region because it connects all of Spokane in a central location, and those coming from the Valley or North Idaho can access fairly easily, too. Don't miss: Boulder Beach is 1 mile west on Upriver Drive, a good cool-down location in the summer if you need a dip in the Spokane River after. FYI: Watch out for mountain bikers on all trails, and make your presence known. The Camp Sekani trailhead further east is a mountain bike skills park. Needless to say, be careful and share the trail if in this area. The area is also popular with rock climbers, too, at the Minnehaha Rocks, so get there early in the day to ensure better parking. Best for: Moderate walking, hiking and trail running. Mileage: Yeah, good luck with that. There's a labyrinth of interacting trails up, down and all around. You just sort of find one and start walking. Why go: It's the western edge of the South Hill and overlooks Highway 195 and the West Plains and Spokane Airport. Simply put, it's a very good hiking and natural area where you wouldn't think you'd find one. How to get there: Numerous access points off of High Drive. Larger parking areas at 57th and Hatch or Polly Judd Park, accessed at the western end of 14th Ave. in Spokane. Don't miss: A few spots toward the bottom feature old cars that at some point in the last 40 or so years went over the cliff and wound up way far below. FYI: A lot of mountain bikers and trail runners are out here, all sharing a narrow single track with steep embankments. Common trail etiquette is to stop and get on the upslope side (or safest area) to let faster trail users through. Tip: The more wooded area to the south has more trails, but not many signs or markings. You'll need to learn by experience (if you get lost, go up). Novice users may want to use the northern entry points or Polly Judd Park due to fewer trails and being more open (thus easier to find your way). Best for: Easy walking and hiking for wildlife viewing. Mileage: One mile or more on interpretive trails. Why go: This being a wildlife refuge and all (managed by the U.S. Fish and Wildlife Service), the focus is not on breaking a sweat on a quad-blasting downhill or getting the heart pumping with a killer uphill. Chill out, pack a lunch, bring the binoculars and come see some wildlife while learning about the region's rich geologic history in an 18,000-plus-acre setting. How to get there: 26010 S. Smith Road, Cheney. From I-90 westbound toward Cheney, take the Four Lakes exit 270. Continue south on Highway 970 toward Cheney. Follow 904 through Cheney, westbound, turning left at K Street / S. Cheney Plaza Rd. Follow S. Cheney Plaza Rd. into Turnbull. FYI: $3 entry fee per vehicle, March through October. This is a federal, not state, property. The Washington State Discover Pass will not get you in for free. Tip: Bring binoculars, and get ready to learn. Why go: Because everyone else does. Really, it's a popular spot right on the edge of Coeur d'Alene's tourist and restaurant district, but still relaxing enough to get away from the city for just an hour or so. Plus, great lake views. How to get there: 210 S. 3rd St,, Coeur d'Alene. The trailhead and large parking lot is just east of the Coeur d'Alene resort marina, at the southeast corner of McEuen Park. Don't miss: All the great restaurants and dining options in Coeur d'Alene after your hike. Tip: Lots of people walk on the first third of the trail to access the beach. If you can't beat 'em, join 'em (i.e., bring sandals and swimwear). Mileage: 3.3-mile partial loop trail and out-and-back. Why go: A perfect blend of good views near Lake Coeur d'Alene mixed with lots of interpretive signs. It's educational and recreational. Can't beat that. Also, there are plenty of chances for bald eagle viewing, particularly during kokanee salmon spawning season throughout December and early January. How to get there: 11 miles east of downtown Coeur d'Alene. Follow I-90 east 8 miles to Wolf Bay Lodge exit 22. Follow US 97 south for three miles to trailhead. Don't miss: Interpretive signs galore. Take extra time to read and appreciate the natural history and education. Yeah, even on summer break the kids (and adults) can learn. Tip: Remember binoculars and camera with a good lens for possible bald eagle viewing. Mileage: Three miles out and back with 500 feet of elevation gain. Why go: It's a relatively easy hike within Heyburn State Park with open views. While North Idaho gets a lot of love from Coeur d'Alene in the north, this southern end of the lake between Plummer and St. Maries is worth checking out for good local hiking. How to get there: This hike commences from Hawley's Landing within the park. From Coeur d'Alene, follow US 97 south toward Plummer. In Plummer turn right on Highway 5 heading east. Follow signs to Heyburn State Park and Hawley's Landing. History: Heyburn, created in 1908, is the oldest state park in the Northwest. Mileage: 3.7 miles out and back with about 1,200 feet of elevation gain. Why go: Close to Sandpoint on the south end of the Long Bridge, it's a popular spot with really far-reaching views, worth the drive if you're coming from afar. How to get there: Driving north on Highway 95 toward Sandpoint, turn right onto Bottle Bay Road before crossing Lake Pend Oreille and the Long Bridge. FYI: The area is also popular with mountain bikers, so watch out on blind corners. Best for: Moderate to advanced hiking and rock climbing. Mileage: Four to 11 miles depending on approach and how far up you go. Why go: Chimney Rock is among the most recognizable features in the North Idaho Selkirk Range (similar to Liberty Bell Mountain in Washington's North Cascades). If you're looking for an advanced hike (or overnight backpack), this is the place to go without too far a drive from Sandpoint or Coeur d'Alene. How to get there: There are west and east approaches to the rock, the east route more accessible for cars to the trailhead. East approach: From Highway 95, drive from Sandpoint north toward Bonners Ferry. In about 7 miles you'll approach the small town of Samuels. Turn left on Upper Pack River Road, which becomes National Forest Road 231. In 17 miles, the parking area will be on the left.